"A native encounter with angels"
OHSWEKEN - Just before Christmas, I read a review of Sophy Burnham's Book of Angels. Angels are a vital part of the Christmas story. Even before the birth of Christ, an angel appeared to Mary's cousin, the mother-to-be of John the Baptist. Then an angel appeared to Mary herself. After Jesus' birth, a host of angels appeared to the shepherds according to the story. Ms. Burnham's book is a collection of stories about encounters with angels by people of various cultures. She did not mention the Seneca prophet Handsome Lake in her book but she could have done so. 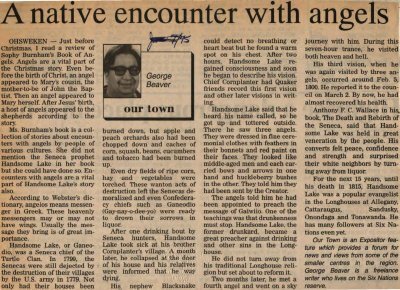 Encounters with angels are a vital part of Handsome Lake's story also. According to Webster's dictionary, angelos means messenger in Greek. These heavenly messengers may or may not have wings. Usually the message they bring is of great importance. Handsome Lake, or Ganeodio, was a Seneca chief of the Turtle Clan. In 1799, the Senecas were still dejected by the destruction of their villages by the U.S. army in 1779. Not only had their houses been burned down, but apple and peach orchards also had been chopped down and caches of corn, squash, beans, cucumbers and tobacco had been burned up. Even dry fields of ripe corn, hay and vegetables were torched. These wanton acts of destruction left the Senecas demoralized and even Confederacy chiefs such as Ganeodio (Gay-nay-o-dee-yo) were ready to drown their sorrows in liquor. After one drinking bout by Seneca hunters, Handsome Lake took sick at his brother Cornplanter's village. A month later, he collapsed at the door of his house and his relatives were informed that he way dying. His nephew Blacksnake could detect no breathing or heart beat but he found a warm spot on his chest. After two hours, Handsome Lake regained consciousness and soon he began to describe his vision. Chief Cornplanter had Quaker friends record this first vision and other later visions in writing. Handsome Lake said that he heard his name called, so he got up and tottered outside. There he saw three angels. They were dressed in fine ceremonial clothes with feathers in their bonnets and red paint on their faces. They looked like middle-aged men and each carried bows and arrows in one hand and huckleberry bushes in the other. They told him they had been sent by the Creator. The angels told him he had been appointed to preach the message of Gaiwiio. One of the teachings was that drunkenness must stop. Handsome Lake, the former drunkard, became a great preacher against drinking and other sins in the Longhouse. He did not turn away from his traditional Longhouse religion but set about to reform it. Two months later, he met a fourth angel and went on a short journey with him. During this seven-hour trance, he visited both heaven and hell. His third vision, when he was again visited by three angels, occurred around Feb. 5, 1800. He reported it to the council on March 2. By now, he had almost recovered his health. Anthony F.C. Wallace in his book, The Death and Rebirth of the Seneca, said that Handsome Lake was held in great veneration by the people. His converts felt peace, confidence and strength and surprised their white neighbors by turning away from liquor. For the next 15 years, until his death in 1815, Handsome Lake was a popular evangelist in the Longhouses at Allegany, Cattaraugus, Sandusky, Onondaga and Tonawanda. He has many followers at Six Nations even yet. Burnham, Sophy ; Lake, Handsome (Ganeodio) ; Wallace, Anthony F.C.